HOPublishing has completed a DVD documentary based upon our award winning book Where They Raced. The DVD attracted a lot of attention and won the prestigious Motor Press Guild Award for Best Audio/Video Presentation, 2013. It also claimed the 2014 Golden Wheel Award at the International Reel Wheel Film Festival in Knoxville, Iowa. Unfortunately, the DVD director/producer has chosen to represent himself as owner of Where They Raced. He is both fraud and thief. We have been writing CAR REVIEWS for several years via LACar.com and just recently added video to augment our written BOOK REVIEWS. Videos are posted within the written reviews on this site as well as YouTube. Our latest video excursion involves the 1915 Venice Grand Prix. Recorded live at Ultimatte Studios in Chatsworth then repeated at the Petersen Automotive Museum in Los Angeles. We've also shot some video with both Adam Carolla and Jay Leno in regards to Where They Raced. There's a bit of shtick involved but they are a couple of genuine car guys. Video links are under APPEARANCES. HO Publishing.com features photos, data, and other information about the auto racing history of Southern California. 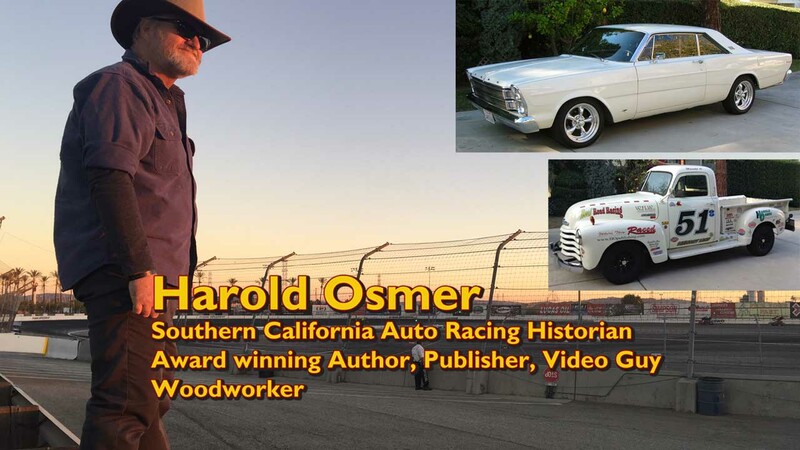 Harold Osmer has written three books on the subject and each are available through the Where They Raced, Real Road Racing, and Saugus Speedway buttons at your left. We have sponsored cars at Ascot, produced the program for USAC's Turkey Night Grand Prix since 2001, announced the 2012 & 2013 SCTA Bonneville Speed Weeks, had a weekly radio show LIVE from Irwindale Speedway and fielded two cars at the 24 Hours of Lemons (check the link for photos and video). Yeah, we've been around. ps...The three HO Publishing books are no longer available through Amazon.com. We had a good run of 12 years, but shipping costs killed the deal. It has always been cheaper to get them direct from us anyway. Where They Raced LAP2 is completely sold out. Our Where They Raced documentary is on DVD and getting great reviews. Where They Raced LAP2 is THE book about auto racing in Southern California - where more auto racing has taken place than any other place in the world. Saugus Speedway played host to auto racing in Southern California for over 50 years before getting unceremoniously terminated by the property owners. Real Road Racing tells the full story of the Santa Monica Road Races 1909-1919 in the days of chain drive, wooden spokes, and hair-for-helmets. Our car reviews are written to inform rather than entertain. We include a standard list of features/specs and follow a fairly regular format. HO Publishing has the privelege of reading a variety of books on many topics. Our book reviews go online at a number of sites, including our own. The Turkey Night Grand Prix is th emost prestigious midget race in the USA, thus the world. It's been held in Los Angeles since 1934. 24Hrs of LeMons is 24 hours of great road racing fun for $500 cars. Harold O. has made appearances on the Huell Howser Show, Adam Carolla, and Jay Leno, among other places.